Sensational 9th floor top-of-the-line seaside penthouse apartment with wall to wall and floor to ceiling windows offering completely open 180 degree, breathtaking, panoramic views of the beach, harbor and coastline as well as mountain views for a one-of-a-kind luxury holiday experience. Impressive, air-conditioned downstairs living/dining room with deluxe furnishings and large flatscreen smart TV, bluetooth speaker and high-speed internet with wifi. Opens up via glass wall to balcony with dining area comfortably shaded via electric awning. The first floor also includes a modern high-end, granite, fully- equipped kitchen plus powder room / WC, hall closet and open staircase leading to second floor. The 2nd floor is comprised of two bedrooms both with floor-to-ceiling windows that open up as built-in balconies enabling one to enjoy the magnificent views and sound of the surf. Elegant, beautifully decorated bedrooms include the highest quality mattresses and have ample closet space, mirrors and flatscreen smart TVs with bluetooth wall speakers for music. Both queen as well as single bed options are available. Two separate, roomy and air-conditioned bathrooms comprising granite counters with double sinks, two spacious glass shower areas, bathtub, bidet and wc’s. South bathroom also fitted with bluetooth controlled ceiling speakers. This stunning, newly designed and completely refurbished beachfront penthouse apartment with all possible amenities is a one-of-a-kind showpiece in the Skol building and offers a sensational luxury holiday experience beyond compare. Be among the privileged first to book! The Skol is a highly popular, centrally located beachfront building with all amenities. 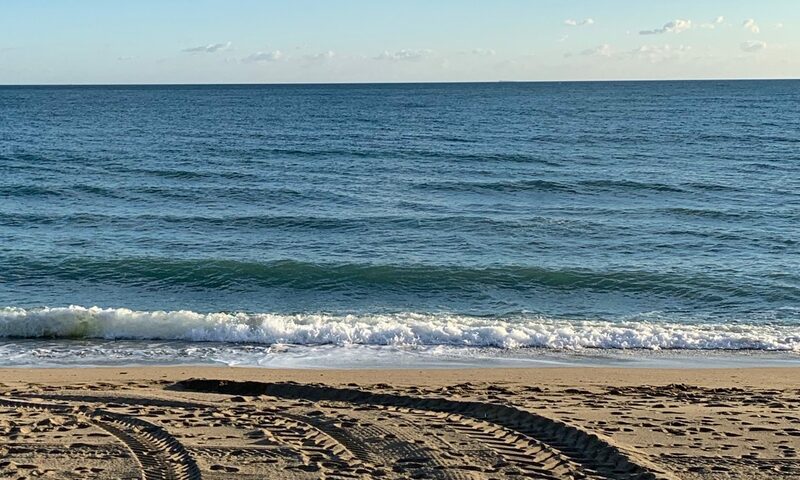 The building has a large reception, beautiful gardens with two full-sized swimming pools, a poolside restaurant/bar and direct access onto the beach. 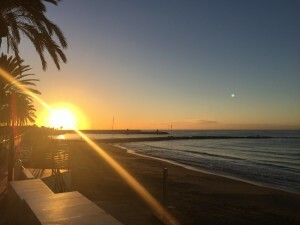 It is situated on Marbella’s beautiful, marbled beachfront walkway with its many restaurants and bars and Marbella’s enchanting old town is only a few minutes short walking distance away. Due to the Skol’s prime location, car rental is not a necessity. 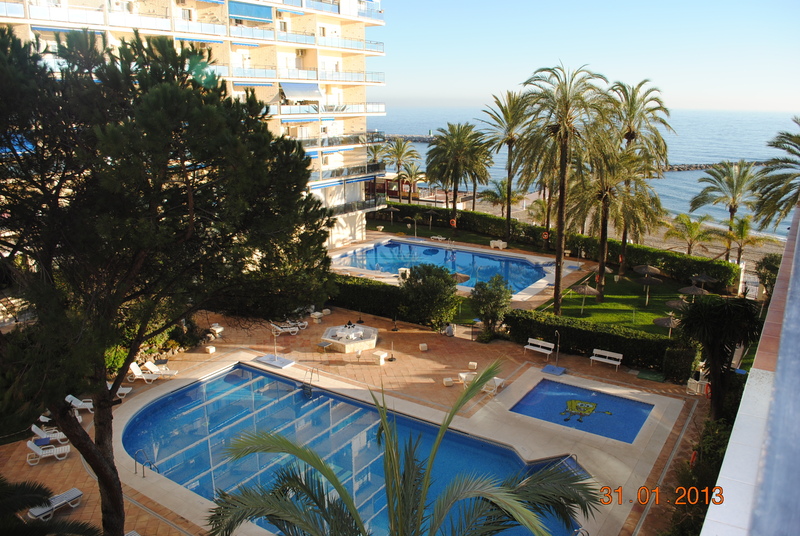 Skol apartments, Marbella – external photos of the gardens, pools etc. 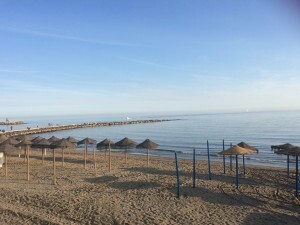 Now with over 70 Skol and Parque Marbella holiday rental apartments, Linglyn Travel Marbella Holidays have a great selection of apartments for you to choose from. We can offer studios, 1 bedroom, 2 bedroom and 3 bedroom apartments as well as 2 and 4 bedroom luxury suites. 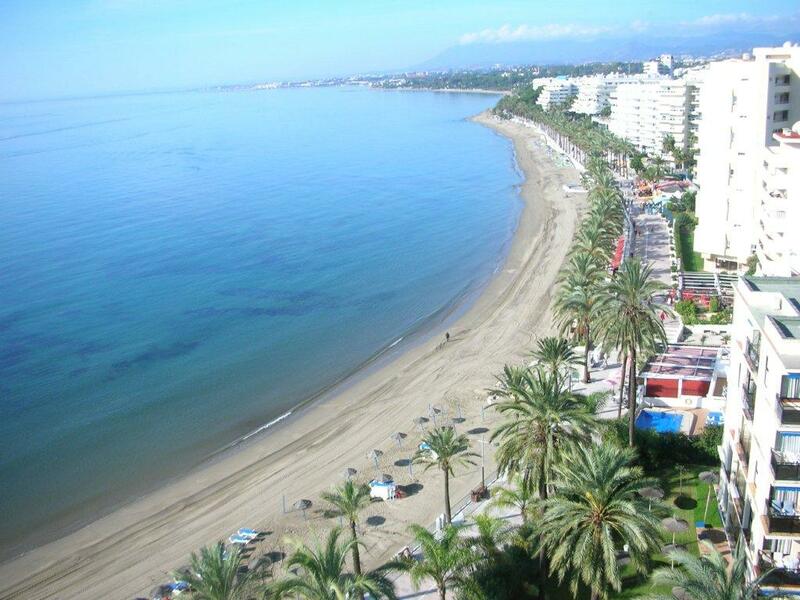 We will have your ideal Skol or Parque Marbella rental apartment for your next Marbella beachfront holiday. 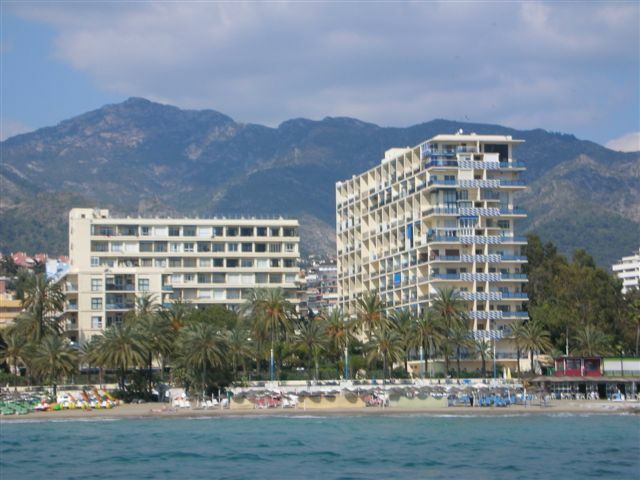 The Skol apartments, on the beachfront in central Marbella Town, have been popular with clients from all over the world since 1966. 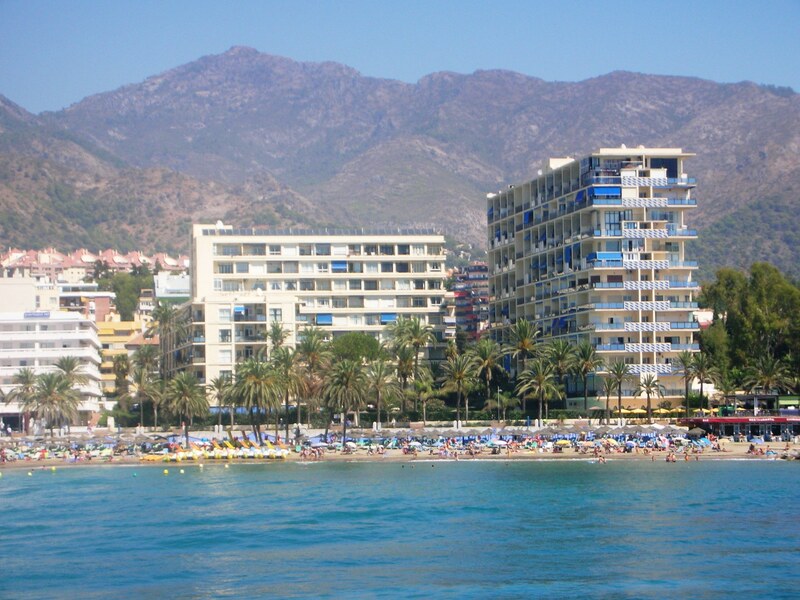 The Skol is surrounded by good quality shops, restaurants, supermarkets and bars, meaning there is absolutely no need for a car during your holiday, unless you want to go touring and explore the area. You can visit Ronda, with its fabulous gorge and Gibraltar with the famous apes. If you wish to explore a little further afield, there is Cordoba, Seville, Granada and Cadiz, to name but a few!. The well tended gardens of the Skol contain 3 swimming pools, a large family pool with a children’s pool attached and an adults pool for the serious swimmers!! There are loungers available in the gardens to relax. (A small local charge of €2.00 per day applies to each lounger and this covers the supply of a lounger pad which will be carried to the lounger of your choice by the pool staff). There is a cafe / bar in the garden which normally operates from mid-May to October for snacks, meals and drinks etc. 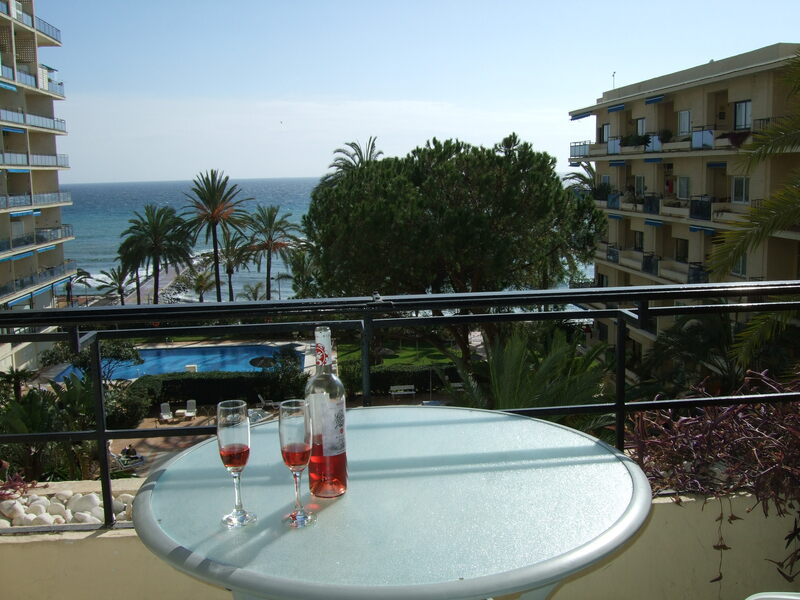 The Skol is situated right on the “Paseo Maritimo”, the beautiful marble promenade, which is pedestrian only and traffic free. You can take a stroll down the Paseo and visit Puerto Banus. Once you have visited us at the Skol, you will want to return, as many of our regular clients do, year after year! . Daniela looks forward to personally welcoming you soon! 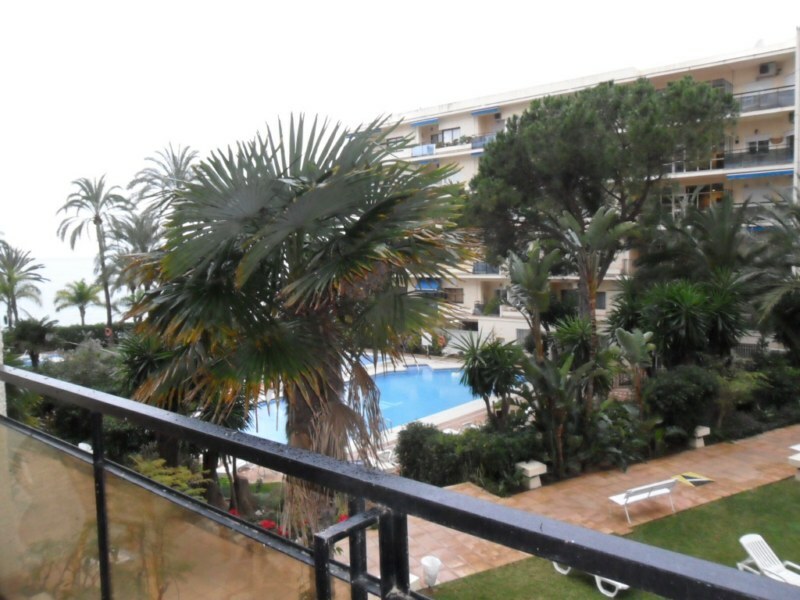 Skol Apt 811A Modern 1 Bedroom apartment with own exclusive FREE WIFI! 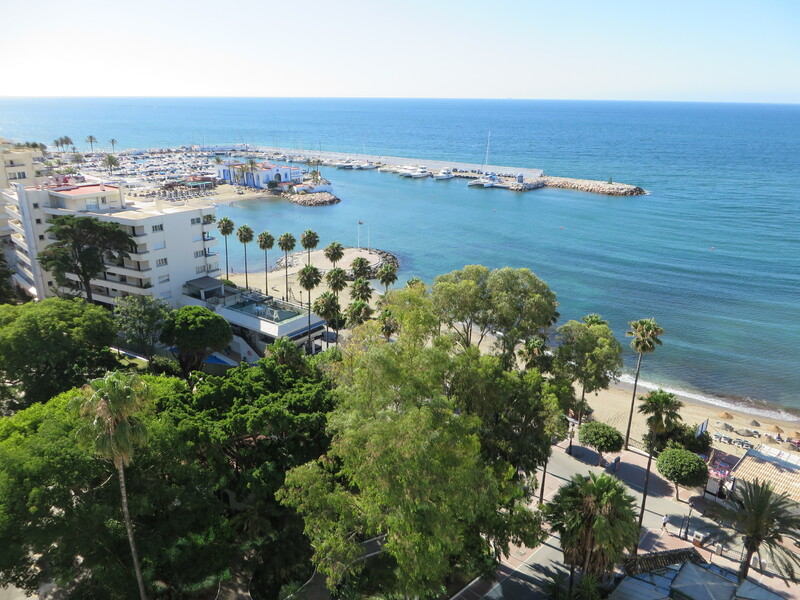 Skol Apartments, Marbella – Skol 424C is a beachfront, sea-view, 4th floor east facing air conditioned 1 bedroom, 1 level apartment and is ideal for 2 people. There is a sofa-bed in the lounge for a 3rd or 4th person at a small extra charge. Ideal for a relaxing holiday. 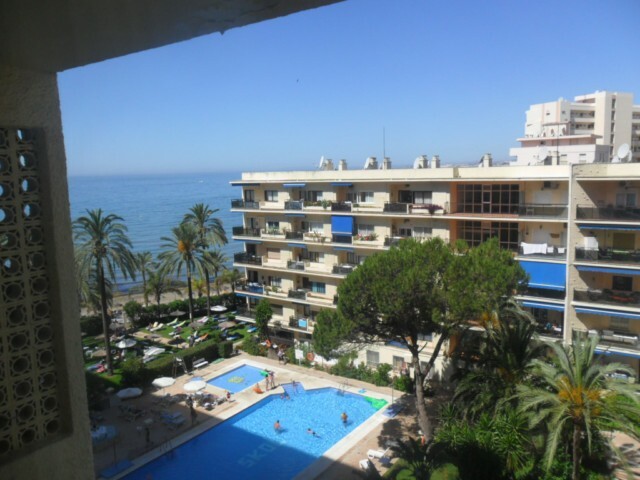 With lovely beach and sea-views from the balcony, you are also looking over the 3 pools and beautifully manicured gardens of the Skol apartments, Marbella. 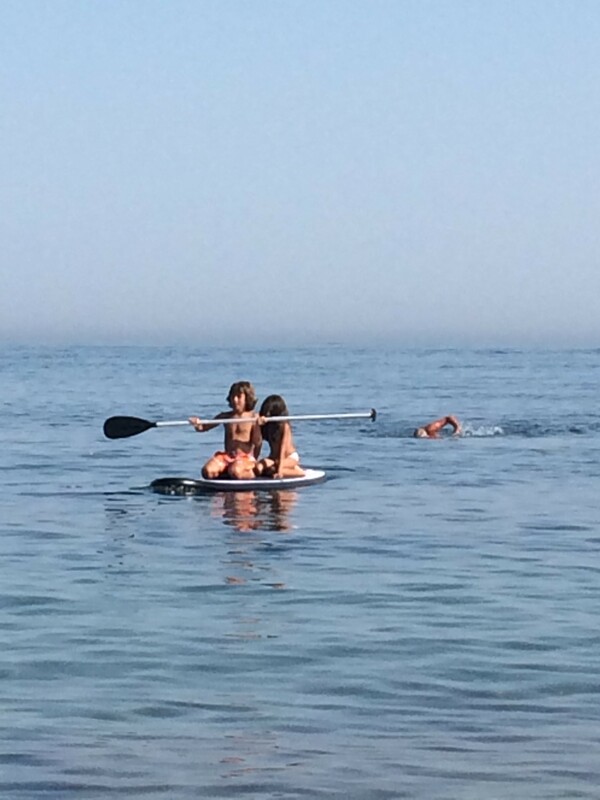 There is a family pool with a childrens pool attached and an adults pool for the serious swimmers. For the sun-worshippers, there are sunloungers all around the garden. 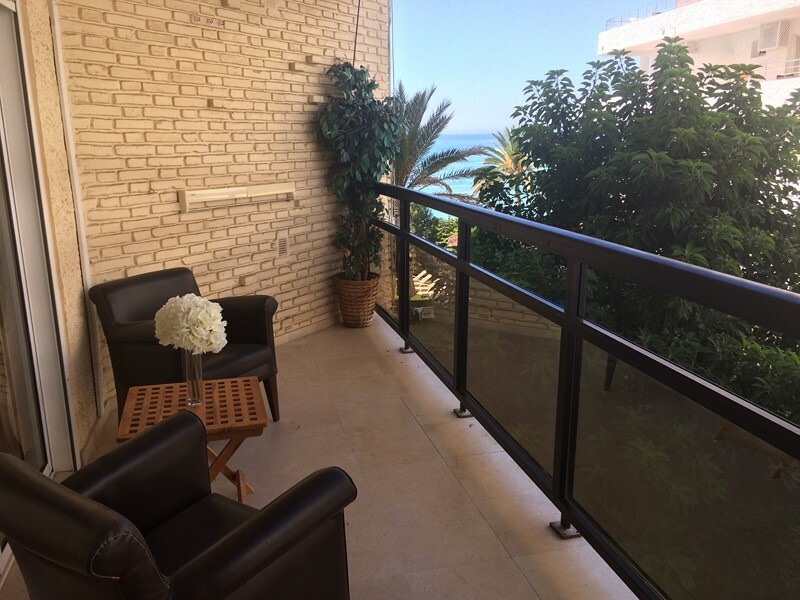 Duplex apartment with 2 bedrooms (2 single beds in each one), 1 bathroom (with shower), fully air conditioned, terrace with views to the mature tropical gardens and beach. 1/2 floor, West facing, afternoon sun. Fully fitted and equipped with LED SKY TV in lounge and a small one in every bedroom. Private WIFI. Duplex con 2 dormitorios (2 camas individuales en cada uno), 1 baño (con ducha), aire acondicionado, terraza con vistas a los jardines tropicales, piscinas y playa. Planta 1/2, orientacion Oeste, sol de tarde. Totalmente amueblado y equipado con television LED en salon y una pequeña en cada habitacion, WIFI privado. 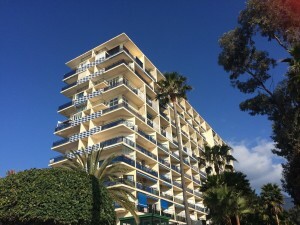 Contact Daniela from Skol Apartments Marbella NOW!! » Get Skype, call free! We are waiting for your call!